Click here to read an FSA Penalty against Alpari in May 2010. Alpari UK went under in the SNB-CHF crisis. Alpari UK are forex brokers. Alpari UK offers the MetaTrader 4 and MetaTrader 5 top forex trading programs. 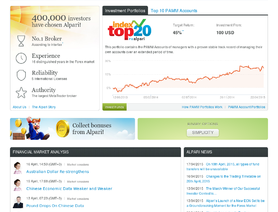 Alpari.co.uk offers over 50 forex pairs for your personal investment and trading options. This broker has gone bust. Administrators have emailed all clients. Revenge for all who were scammed time and again by this joke house. On 16-Jan-2015, I found my three open trades were closed without my consent. This suffered me a loss of 175 USD. If these trades were not closed, I would have earned a considerable profit. Later on the platform was disabled and I was unable to do any trade. I requested withdrawal my remaining balance but till now (21-Jan-15) nothing received on my account. The platform is still disabled. I tried live chat, but no response even it was working hours in UK. My trade platform is still disabled. Even all the pages in the website where I can control my account are also inaccessible. I have complained Alpari UK customer service twice, no response till now. I don't know what will happen to my account's remaining balance (about 3000 USD). Previously on my account, few unauthorized trades were conducted, very high volumes. Alpari UK denied any responsibility. Someone can advise me what type of actions I might take. I have to inform that not only Alpari but other top big tycoon suffer heavy shock of volatility. My clients have opened and traded accounts in different brokers and i am advising all my clients to withdraw all amount and stop trading immediately until scenario will clear. I do not mention broker names but they delays withdrawal of payments of my clients too. thats real alarming situation. Few of my client said that they told by their broker that they will repay any loss occurred on trades of CHF but i think that is just a lollipop and trying to hold clients trust. PS: In coming days it is expected that some more brokers announce insolvency if heavy bailout package not announce for them by their governments. Trading stopped today 16.1.2015 around noon. In the news and on their hompage I can read they went bankruptcy due to missing liquidity when the SNB dismissed the 1.2 barrier for CHFEUR. Too bad. I hope not to loose all my money there since I made a big win on USDCHF short yesterday. This is mad! I trade with this broker for 2 years and I find it to be one of the best for professional traders. Good but not excellent execution of orders and profit withdrawal is short time too. Been using this broker for almost 4 years now.honestly is the best one, no more to say. I've had an account with Alpari for about 5 years. I like the fact that you can invest in PAMM accounts and that there are many platform, instruments, and account options. Execution is good and customer service is good. I will continue to maintain an account with them primarily for MT4 and to run my EA's.